Visitors to Europe would be familiar with the phenomenon of being cathedralled out. This is when you visit lots of cathedrals in a short space of time, to the point that you tire of even the grandest of cathedrals. The same happens with the temples of Asia. To be templed out. Having spent much time in Thailand I have experienced a dose of wat fatigue myself. I didn’t see any Buddhist quotes that prepare you for this experience. 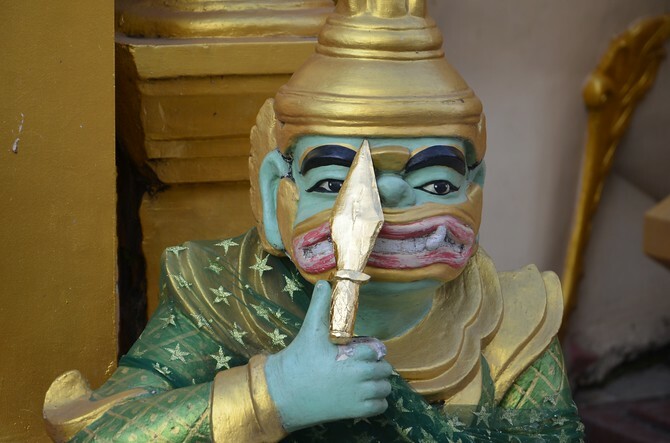 In the mysterious land of Myanmar there is a temple that will awaken anyone from the deepest of temple fatigue. 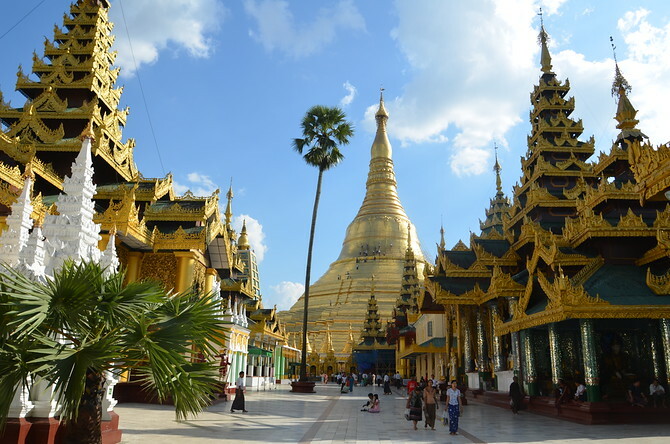 Introducing the Shwedagon Pagoda in Yangon. The first hint for me that this is not your every day temple was while looking out the window flying into Yangon. There was a brown haze firmly stuck over the city, yet the golden stupa shone brilliantly in the morning light. The Pagoda is a few kilometres (or miles, as they still use here) outside the city centre and it dominates the skyline. As I walked closer I realised that what I was seeing is one of the great temples of Asia; up there with Angkor Wat and Borobudur. 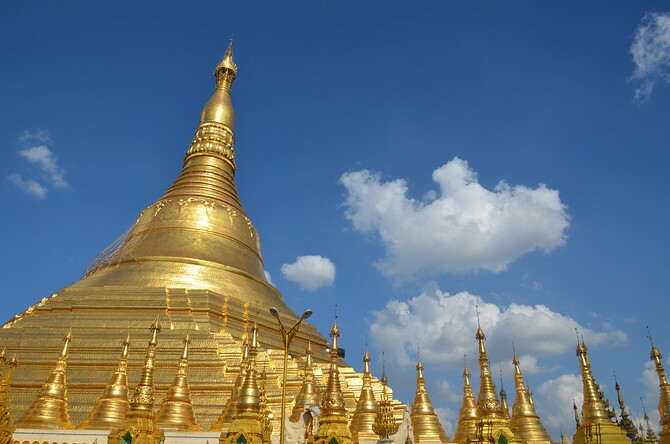 How old is the Shwedagon Pagoda? Historians say that the pagoda was built between the 6th and 10th centuries AD. Legend has it that the original temple is over 2500 years old. It was built to enshrine eight of the Buddha’s hairs, which were given to two merchant brothers by the Lord Buddha himself. Over the years the shrine was added to, destroyed by earthquakes and wars, and rebuilt and improved. Like the Ship of Theseus, there has been so many replacement parts over the years that what you see today is not original. At over 2500 years old the Shwedagon Pagoda would be the oldest Buddhist temple in the world – even older than the Mahabodhi Temple in Bodhgaya, India, where the Buddha attained enlightenment. Without solid evidence it would be more probable to be as old as the historians say. Since my visit to Shwedagon, archaeologists have discovered what they think is the world’s oldest Buddhist shrine in Lumbini, Nepal. The structure inside Mayadevi temple dates from the sixth century BC (around the time of Buddha’s birth). 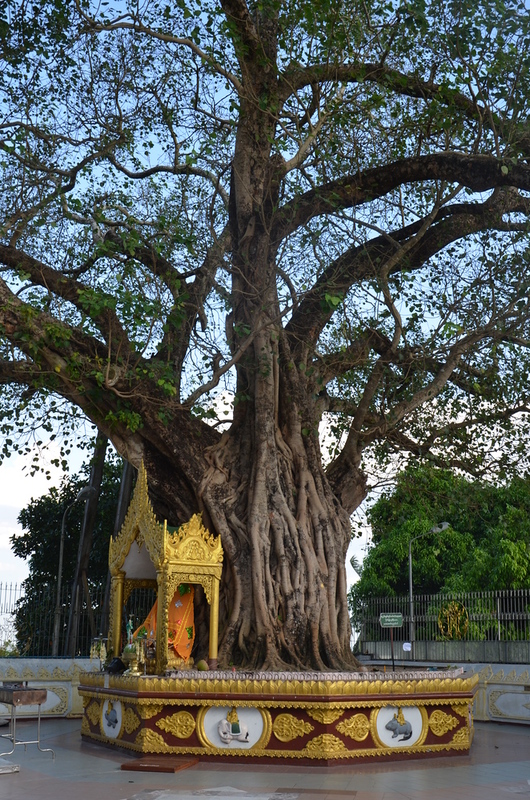 Speaking of Bodhgaya, within the temple complex there is a banyan tree that is descended from the Mahabodhi Temple, the same tree that the Buddha sat under. 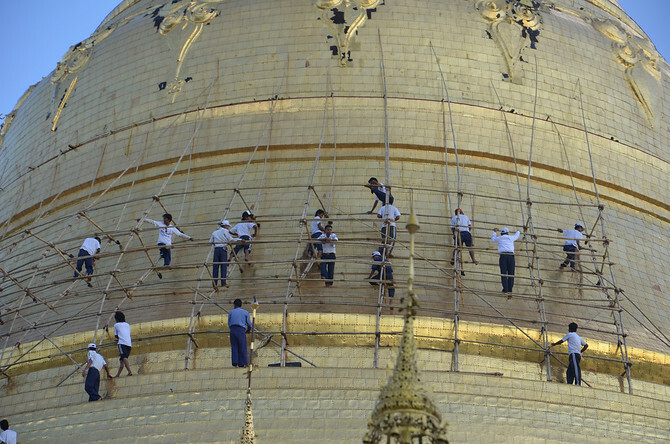 How much gold is at the Shwedagon Pagoda? Another question that doesn’t come with a straight answer. Trying to find out how much gold is here is an exercise in futility. An online search will give you answers from 9 to 60 tonnes, and that number is constantly changing. There is always worshippers applying gold leaf to something, and in the case when I was there, workmen adding another layer of gold to the Zedi. I easily spent a few hours wandering around the little temples within the complex. It is best to come in the late afternoon to avoid the fierce heat and to see the temple as the sun is setting. So there it is, one of the great temples of the world. While I have been shaken from my temple fatigue, I pity the poor temple I visit next. This is a hard act to follow. This is so beautiful! 🙂 And you rarely see that shot of it with the city surrounding…it’s HUGE! I know, it’s HUGE! You shall soon hopefully find out. first place I ask my family to take me the minute I land in Yangon.. every time. you are blessed to have had the opportunity to visit it. Hope you are well. Hey James, thanks for sharing via ths post mate. 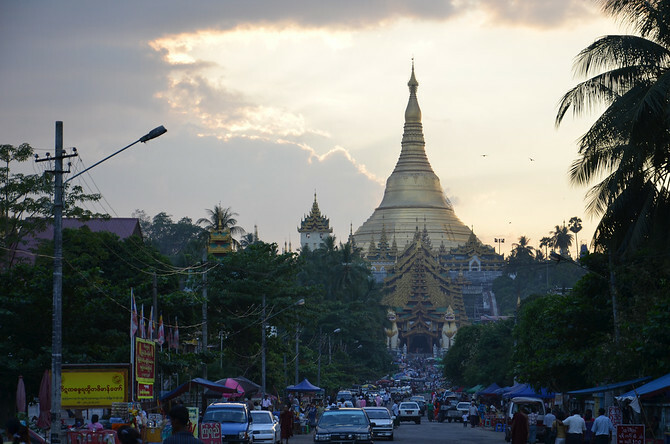 I will be walking the streets of Yangon in a few days time and can’t wait to check out this truly impressive site. 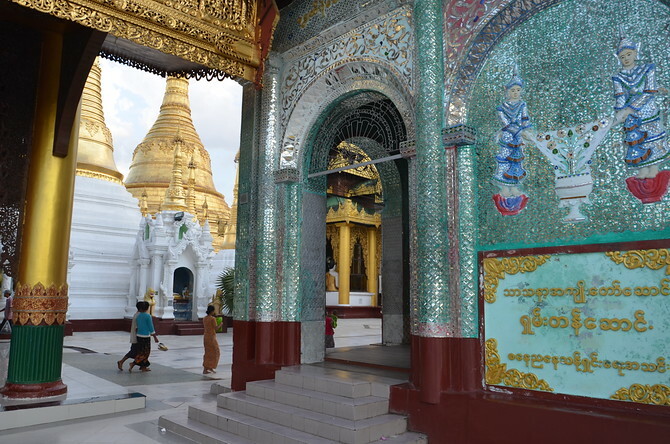 I never knew much of the Shwedagon Paya until planning my soon to be underway trip. Hi Jason, that’s great you will be there soon! I didn’t know much about it either, which added to the surprise when I saw it in real life. I had no expectations attached to it. Are you going to be in Thialand anytime soon? Would be great to meet up. That is really cool. The country is still pretty much isolated compared to other Asian nations so you don’t hear much about what they have there. Looks beautiful. It’s true. There was much about Myanmar I didn’t know about, so it made for a trip with few expectations. Great post. I ended up here trying to find out how much gold there is as I kept getting different answers too. Thanks for sharing! Do your homework better, stop lazily following the local propaganda literature. Its not 2600 years old as the Burmese legends have it since the Buddha only lived 2558 years ago ( as of 2015), and even then it took a few hundred years for King Asoke to spread it beyond Northern India, and pagodas seem exclusively linked to Buddhism. Furthermore no thriving kingdom or group settled or organised themselves here until late in the first millenium, it’s reckoned by archaeologists to date to the 6thC at the earliest, comprising likely of something far more modest. Shwedagon Pagoda always blows my mind. I think this pagoda is one of the most amazing pagoda in the whole world. As mentioned in the articles, the amount of gold in Pagoda is always changing. 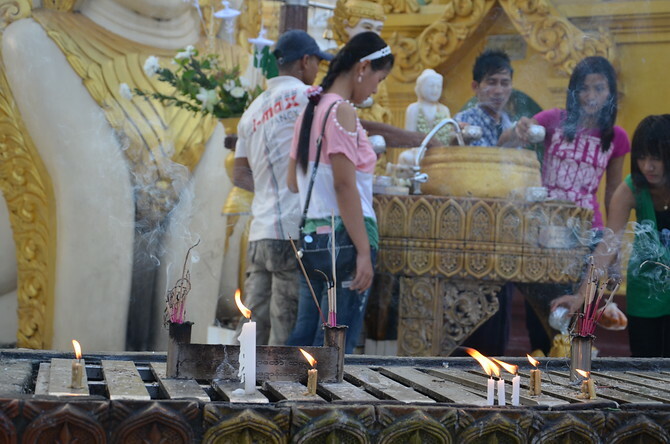 People always apply gold leaf as a part of their respect and devotion to Buddhism.